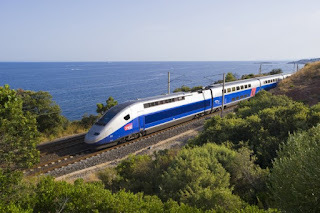 As we boarded the high speed rail from Valencia to Barcelona, we were filled with great expectations. We were going to meet and stay with our daughter, our son and his wife for a week long stay in Spain's most vibrant, art filled city. And once again, AIRBNB did us really proud. First and foremost, train travel in Spain is , shall I say it, fabulous! And in Spain, it is ridiculously cheap and very very fast and clean. Imagine flying the way it was back in the day - quiet, clean and really nice, pleasant people. I have said it before and it bears repeating, especially in Espana - Those Europeans got this train thing figured out! Our AIRBNB, for the five of us, was in the heart of downtown Barcelona within easy walking distance of virtually everything. Although, you could spend a year in this amazing city and not see all of its beauty and quality design around every corner. I always suggest staying as close to the "must sees" as possible and, as I have said without hesitation or apology, if you find the right AIRBNB, you will always get more than you expect for less than you expect. The Stylish Apartment C In City Center in Barcelona is just such a place. So, if you want an amazing place to lay your head after a day of walking, eating and hanging out in one of Europe's most exciting cities with architecture and artistic flair like no other, then I highly recommend AIRBNB and Antonio's place only steps from restaurants, Antonio Gaudi landmarks and other fascinating sites. And if this particular place is full when you go, check out more AIRBNB choices. You'll thank me and your wallet will love you. This Week's Travel Quote - One of the few luxuries left is travel. And the aspect of travel that is luxurious is not the movement, but the being there - Andre Balazs. Hallelujah!!!! And This Week's Tune - From the incomparable Diana Krall - Fly Me To The Moon.